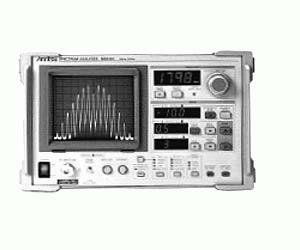 The MS610C/K is a compact, lightweight portable spectrum analyzer that has low power consumption. Battery back-up of the panel settings allows testing to be started very quickly whenever the MS610C/K is used for testing in the field. Also, the MS610C/K has a high-luminance CRT display, protectors, and an optional tilt handle. A sensitivity of -25 dBµV (-132 dBm) is achieved by connecting the ultracompact MA8610A pre-amplifier directly to the MS610C. They digitally display the level of the center marker of the screen via a large LED display and can measure transmission characteristics in combination with a tracking generator. Also, they can be easily configured into an automated measuring system via the GPIB option. A battery pack is available for outdoor use.